The Canon PowerShot SX620 HS features a new 25x optically stabilised lens giving a 35mm-equivalent focal length of 25-625mm and slightly faster maximum apertures at either end of the range. Otherwise, the Canon PowerShot SX620 HS offers the same 20.2-megapixel back-illuminated CMOS sensor, DIGIC 4+ processor, continuous shooting speed of 2.5fps, 3-inch 922,000-dot LCD monitor, Wi-Fi connectivity with NFC pairing and Full HD video recording as its predecessor, the SX610 HS. The Canon PowerShot SX620 HS is available in red, black and white and retails for $249.99 / £219.99. 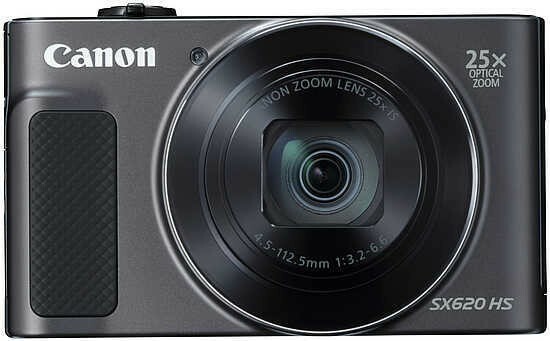 The Canon PowerShot SX620 HS is essentially almost exactly the same as its predecessor, the SX610 HS, with the biggest change being a longer zoom lens that's ever so slightly faster in terms of maximum apertures at both ends of the range. It's also slightly smaller and a whole 9 grams lighter than the previous model (! ), battery life has increased slightly to 295 shots, the various buttons and controls are even more tiny, and there's a slightly larger curved handgrip on the front. Otherwise, very little has changed since 2015's SX610 camera, so almost all of the comments that we made about the SX610 apply equally to the SX620. The PowerShot SX620 HS has a large front finger ridge and a more generously-sized rear thumb rest which help make it sit more securely in the hand. This is partly helped by the Canon PowerShot SX620 HS’s relatively chunky dimensions, measuring 96.9 x 56.9 x 27.9 mm and weighing 182g ready-to-shoot complete with battery and memory card. The Canon SX620 has the same 3-inch LCD screen with 922,000-dots as the SX610, and viewing angles and colour accuracy are still top notch. There’s enough brightness to cope with most environments, and though you’ll struggle when shooting under very bright sunlight, such conditions will overpower most compact camera monitors. Sadly, the screen still isn’t touch-sensitive, which will likely confuse and/or infuriate one of this camera's main target customers, smartphone-users. Build quality remains high, with premium plastics accented with tactile metal details. There’s also a metal tripod mount – a rare luxury at this price point – and you can choose from black, red and white case colours. Once again the SX620's control layout remains the same as the old model. If you’re unfamiliar with recent Canon PowerShot compacts, the most puzzling control will probably be the switch to the right of the thumb rest on the rear. At first glance this appears to toggle between single-frame, burst shooting and video modes, but that’s not actually the case. The lower position of the three is where you’ll want to start, as this is the camera’s default ‘Smart Auto’ shooting mode. In this setting the SX620 HS automatically detects the scene you’re focussing on and adjusts shooting settings accordingly. If you’d prefer to take control of things like ISO sensitivity and white balance, you can by pressing the ‘FUNC. SET’ button in the middle of the d-pad below and choosing the Program Auto mode from the quick setting menu that pops up. This menu also contains the various scene modes which can be manually selected when photographing tricky subjects like fireworks, night-time or snow scenes. You’ll also find the camera’s six filter effects here. This limited filter selection may seem a bit stingy when compared to the 10+ styles that some rival cameras contain, but the Canon PowerShot SX620 HS can spice up your shots in other ways. By flicking the mode selector up to the middle position, you can have some fun with Canon’s Creative Shot mode. This feature is included with many Canon compact cameras and instantly captures one standard shot plus an extra five variations of it, each with a different filter effect and crop applied. It’s a useful feature when you want to get creative but don’t fancy wasting time hunting through menus to manually apply different filters. 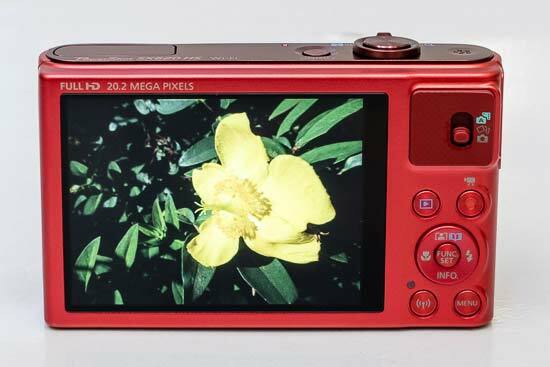 The top option on the mode switch selects the camera’s Hybrid Auto mode, whereby 2-4 seconds of video is captured before each still image and later combined into a 720p digest movie chronicling your day. 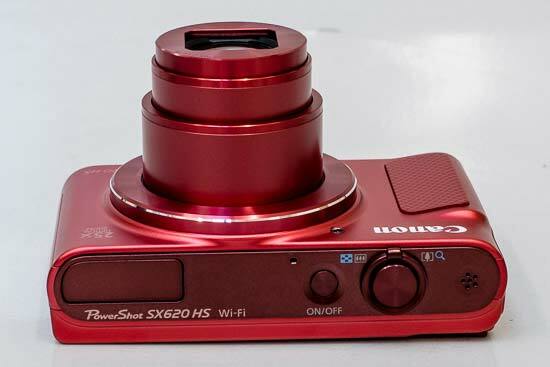 Another nifty feature with the Canon PowerShot SX620 HS is Auto Zoom, activated by pressing the directional dial on the rear panel upward. Now when the camera detects a face, it’ll automatically zoom in and out to keep it framed and at a constant size, whether he or she moves to or from the camera. It’s a clever feature that also works when multiple faces are detected, though you’ll need your subject to face the camera directly for best results. The camera’s Wi-Fi connectivity remains unchanged from the SX610 HS, utilising the same companion Canon Camera Connect mobile app. By pushing the connection button at the bottom of the rear panel, the SX620 HS starts broadcasting a wireless hotspot that’s visible to nearby mobile devices. Simply connect as you would with any other Wi-Fi network, open the Canon app on your smartphone or tablet and you can operate the SX620 HS remotely and download photos from it. If that seems like too much trouble, and you have an NFC-enabled smart device, then you can also tap it against the camera to create a connection. Once connected, a full resolution shot takes around 5 seconds to transfer, and apart from some slight lag when operating the zoom controls, remote shooting is slick and effective. The Wi-Fi system also enables you to use your smart device to tag the SX620 HS’s images with GPS coordinates. This is less convenient than a proper built-in GPS system as you need to sync the camera to your smartphone and rely on the accompanying app, but at least this method doesn’t drain the camera’s battery like conventional GPS. 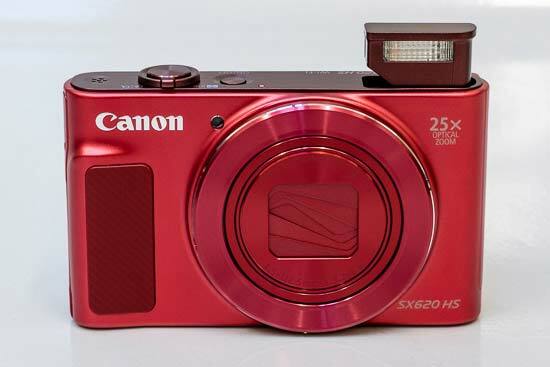 The Canon SX620 HS uses a higher-capacity 1250mAh rechargeable Li-ion power pack than its predecessor, which in practice means that the Canon PowerShot SX620 HS’s battery life has gone up from 270 to 295 shots-per-charge, at least according to the official CIPA rating. The battery life can also be eked out to 405 shots by activating Canon’s Eco mode, which conserves power by dimming the display after just a couple of second’s inactivity, and turning it off altogether shortly afterwards. Pressing any button will restore life instantly. The effect is rather like a start/stop system on a modern car and doesn’t seem to have any downsides, providing you don’t have to wait more than a few seconds between composing and shooting your photo. 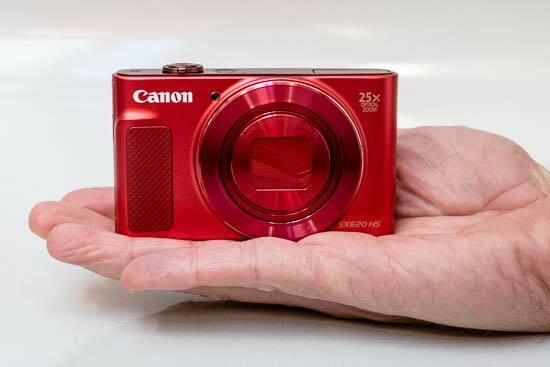 When it comes to start snapping, the Canon PowerShot SX620 HS fires up and shoots in 1.8 seconds. That’s a tad slower than some cameras, as the lens isn’t particularly quick to extend. Fortunately the camera’s autofocus system doesn’t waste much time as it focuses pretty much instantly in good light and only requires around half a second to find its mark in dimmer conditions.